I think most of us strive to be more organised- getting organised is constantly ranked as one of the top ten resolutions that people make every year. But how many of us stick to, or even attempt it? Do you have any systems in place that help your day run a bit more smoothly, or are you constantly running around like a headless chicken because something is lost, buried in clutter or you forgot to do something important? I think very few of us are naturally organised people, I know it's something I struggled with for years until I decided something needed to be done. A bit of planning and preparation is all it takes in some cases to avoid failure or massive meltowns, and knowing where to find your stuff because everything has it's place is a satisfying feeling. Here are a few of the things I do, and my tips on how to lead a more organised lifestyle! Whether you jot down lists in your phone, write them in a diary or pin them up on a notice board, have a list of things you need to do somewhere. Remember to cross off things once they're done, and as soon as you think of something new add it to your list straight away. If you're ever at a loose end one day, bored or just have an hour to spare take a look at your list, is there something you can do right now? Having a to-do list keeps you productive, and helps to keep a note of those little things that you might not otherwise get around to doing. Your to-do list is almost like a list of your short term goals, but don't neglect the things you want to get done in the long term too. Things like 'learn to drive' 'graduate from university' and 'save up for a car' are more longer term goals. Long term goals can often be split up into smaller things too, if your aim is something like 'pay all debts within the next year', you could maybe add 'create a weekly debt payment plan' to your to-do list. I usually write a list of goals and then look back on them every six months to a year and see how close I am to achieving them. It helps to keep you on track, and reminds you of where you want to be. Just the act of writing these things down rather than keeping them in your head can be really motivating too. Whether you run an entire home or live with parents and just pay for your gym and phone bill, knowing the exact date that everything's due to be paid means no missed payments or getting into trouble with money. If you have direct debits coming out all over the place and are never quite sure what gets paid when, you're bound to make a mistake at some point. This could lead to overdraft charges and eventually even effect your credit score. If you pay a lot of bills it might be worth phoning up each of the companies and getting the direct debits moved to around the same date, so you have better control of when everything should be paid. I find a good way of keeping track of everything that needs to be paid is by writing it on a calendar (which leads to my next point). I like to have a big month-view calendar pinned up in my kitchen; all important dates, events, birthdays and things I need to pay etc are circled and noted. It means at the start of the month you know exactly what's going on in the few weeks ahead, and means you can be prepared with time and money. Writing things like birthdays in your phone calendar might not be the best option because it only reminds you the day before. If you were planning on buying a present or card, or needed to make travel arrangements that might not be enough time. 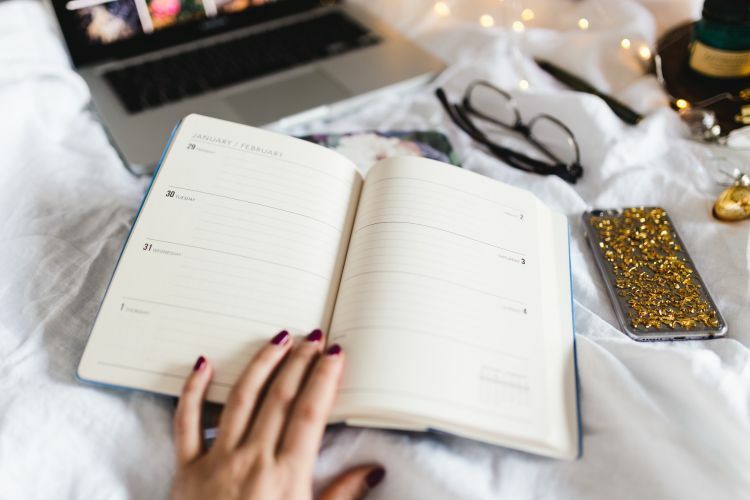 At the beginning of the year spend some time circling and making note of important birthdays and events, then when things like doctors appointments, deadlines or events crop up add them to your calendar straight away. Marking down pay days and the dates that bills/direct debits come out in a different colour is also hugely beneficial- even if you think you're quite organised with money, this way you're never caught short. You can clearly see exactly what needs paying and where you need to be that month meaning nothing can be forgotten about. Keeping organised and knowing where your posessions are saves a lot of unwanted stress, and the easiest way to go about that is by having a clean environment to begin with. If you create a list of jobs that need to be done throughout the week and break them down into small daily jobs, you'll find things stay much tidier and it's easier maintain. If you have a very big job to do or are especially busy, consider hiring a company that offer residential cleaning services, perfect to help you get on top of everything. Do you let your inbox fill up with junk, and find yourself with fifty unread messages a day? So many of my friends do this, I don't know how it doesn't drive them crazy! Take some time one day to go through and unsubscribe to all of the news letters you signed up to with good intentions but never read. Alternatively if you use Hotmail you can select the messages you no longer want to be sent and use the 'sweep' option to send them (and any future messages from that sender) straight to your deleted folder. I recommend creating folders within your inbox, you can do this in Hotmail by adding 'new folder' on the left hand side undeneath inbox, junk, drafts etc. To direct messages to the correct folders, click on them in your inbox and use the 'sweep' option and select the folder you want them to be sent to from now on. All of your bills and statements could be sent to a bills folder for easy access, all of your ebay notifications sent to another and all of your shopping newsletters and promotions sent to another. That way when something important comes through you don't have to scroll through pages of junk or unimportant mail to find it. Any important documents should be filed away somewhere safe. Get yourself a nice file organiser, printed folder or a filing unit and keep them all together. Things like your passport, birth certificate, the paper part of your driving license, your mortgage contract or rent agreement, medical documents and vet documents are all important and should be filed away for safekeeping. Not only does this prevent them getting damaged but means you know exactly where to find them when you need them. Any receipts/warranty guarantees for big purchases are a good thing to keep here too. Making sure all of your possessions have a home means that you'll always know where to look for them, and saves pulling things out searching or turning your house upside down at the last minute before you have to be somewhere. Find good storage solutions that fit your space and budget and assign everything a place, throwing random things in a drawer or box is a fast track way for them to get lost. Get rid of any clutter that you're hanging onto, if it doesn't serve a purpose and is constantly getting in your way maybe it's time to let it go. At least once year it's worth going through your clothes and deciding what's good to keep. It doesn't take long for things like pyjamas and leggings to start looking scruffy, and so anything that's past it's best throw in the bin and make a note of what you need to repurchase. Be brutal, if you haven't worn something for a year because it doesn't fit right or you don't feel comfortable in it, get rid- either pass it to a friend or donate to charity if it's too good for the bin. Even if you don't want to go all out with drawer dividers it's definitely useful to have some kind of system, for example one drawer for underwear, one for pyjamas, one for leggings and tights etc. Getting into a habit of ironing clothes and hanging them up properly once they've been washed is one of the best things you can do; it saves so much time in the long run, and means you're not rushing around like at 7am searching for your clothes and having to iron them before leaving the house. Isn't the handbag such a brilliant invention? With a properly equipped handbag you never need to be without something you need when you're not at home. Granted you can't pack the kitchen sink and a week's worth of shopping, but there are plenty of little things that can help your day run much more smoothly. Get rid of all of the rubbish, papers and receipts and anything that doesn't belong in there and arm yourself with a few essentials that are bound to come in handy when you're out and about. A pack of tissues, an umbrella. If it's cold, a pair of gloves are bound to make your day more comfortable. Read here for ten things I think every handbag should contain. This makes getting a quick shower and getting ready in the mornings so much easier. I like to keep all of my everyday makeup, skincare and haircare products in my dressing table, so I can sit down after a shower and everything is in reaching distance. Even if you don't have a dressing table or don't wear much makeup you could have a basket next to your mirror with things like deodorant, a hairbrush, face cream and a lip balm so they're right there when you get ready in the mornings. In the day or two before the weekly shop when your supply of fresh ingredients might be running low, it's tempting to take the easy option and phone up for an overpriced and unhealthy takeaway. But if you have a couple of store cupboard recipes up your sleeve and a well stocked pantry you'll never be unprepared. There are lots dishes that can be made with ingredients that can be bought in bulk and stored away for months or even years before going out of date. Making sure your store cupboard is always stocked with things like pasta, rice, pulses, tinned vegetables and herbs and spices is always a good idea. Jars of premade sauces, passata, tomato puree etc also last for a long time and are great for store cupboard dishes. Frozen meat, poultry and vegetables also last for many months and are a good alternative when you're low on fresh ingredients. Leading on from number 13 would be always have a shopping list. Turning up at a crammed supermarket and throwing things into your trolley just because they're on offer or look good at the time is going to lead to disaster by the end of the week and you have nothing you need to prepare meals with. There are certain items that you're probably going to need to get every time you shop, the classic 'milk, bread and eggs' for example, other things like your store cupboard ingredients and cleaning products might only need buying every few months. But having a basic list of ingredients and supplies that you can buy for the week based on the meals you cook is a good idea, and will save you from running out of things and having to make unecessary trips to the shop. Once everything has a place, keeping on top of things should be easy. Rather than leaving that pile of papers on your desk spend a few seconds putting them into a file organiser. Instead of shoving that pile of clutter accumulated from throughout the day into a drawer, take a minute to put things where they belong. Hang keys on a key hook, put your umbrella back into your handbag. Then the next time you go to get something it will be exactly where it should be. Magic! This is a great post! I've fallen out of doing some of these lately and it's had such a drastic impact, need to get back into the swing of things! Wow Stacey, this post is like you read my mind! I have really been feeling unorganised and just had a huge clean out/de-clutter of my wardrobe, I feel so much better. I think I'm going to write up some goals next, I really like your idea of breaking them down into smaller, more manageable goals. Thanks for the tips! Great post and helpful tips too. Started following you from Blog hop. Check out my blog hope follow me too. Wonderful post. I have to get my digital photos organized. Just received a digital picture frame and haven't even started to load the images. Shame on me! This bedroom is so pretty! Organization is perhaps my biggest struggle. These are great, practical tips for staying on top of clutter. I'm so glad to have found your lovely blog! I just found your blog from the Big Foot Tribe blog hop. I am now following you. I follow some of your organizing tips, but need to follow a few more! Thanks for sharing all of these great ideas! If only . . . I've never been too organized. I have really enjoyed my visit with you tonight. These are wonderful suggestions and you have spurred me on to get more organised. Great tips, I will definitely keep all of this in mind! Great blog! This was absolutely wonderful - Thank you so much for writing this i really mean it! I've written out a whole list that i itnend to start doing when i get i get in from work! What a wonderful list of reminders! Guilty of "letting things slide" too often! I really liked this, I feel much better after doing some money maths, organising my date book and clearing my bag of junk. This is a great post. Very helpful! I will definitely try this considering i have 3 kids lol. Love this! I'm going to try some of these soon! !